The B+ Suffix: No, this doesn’t mean it’s a mediocre grade school student, rather B+ means that it transmits on both Bluetooth Smart and ANT+. As a result it transmits Bluetooth Smart Speed/Cadence/Power, [Update] but NOT ANT+ Speed/Power. Meaning, you can pair it to an app, but not to a Garmin Edge series unless you have an Edge 520/1000. ‘REAL’ Trainers: These are trainers that include the ‘REAL’ software suite that the company makes. 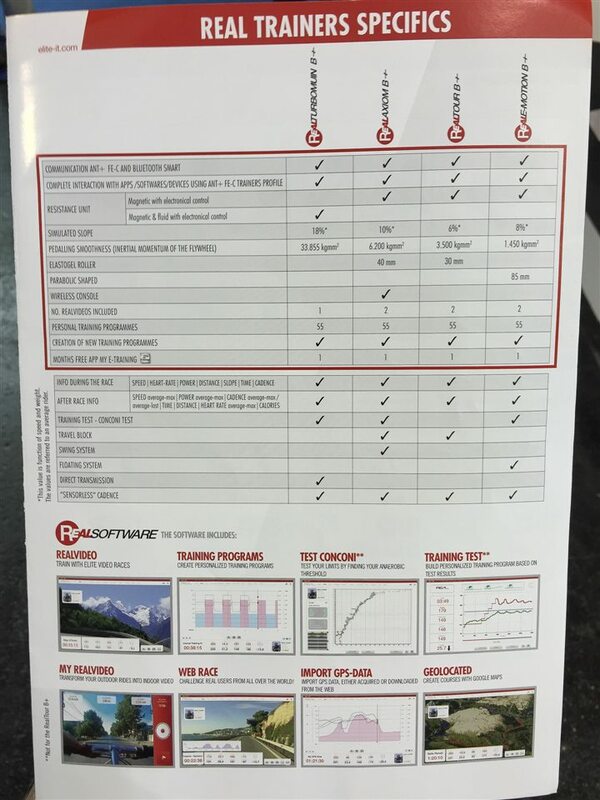 This software suite has tons of functions like following courses outdoors, racing online, etc…. Some of these are done very well and others…not so much. In general, I think you’ll see most of the industry shy away from creating their own apps over the next 1-2 years and instead look to just offer API’s for 3rd party apps using FE-C and whatever the Bluetooth Smart equivalency will eventually be. The FE-C Logo: This ensures that ANT+ FE-C compatible applications can control the trainer (resistance control). Virtually every app worth its salt has or is adding this support (with plenty more announcing it this week). Though, note that FE-C support isn’t really available on iOS apps directly, since Apple devices can’t talk ANT+ (some apps support an iOS ANT+ adapter however). For iOS without an adapter to control it you’d need native Bluetooth Smart trainer control – which is more limited in terms of app support. Misuro B+: This is a small pod that attaches to certain trainers in order to basically give it B+ capabilities. In other words, it can then broadcast its speed/cadence over ANT+/Bluetooth Smart. It does NOT give it FE-C capabilities, since this is basically just a tiny box that is triggered by a magnet. Wheel-on vs wheel off trainers: Some trainers you remove the rear wheel (wheel-off) and attach your chain directly to the trainers cassette. Whereas other trainers are wheel on, which means that you leave the rear wheel attached just like riding outdoors, and the trainer presses against the rear wheel. There are pros and cons to each, but in general wheel-off is quieter and usually costs more. It also reduces the slip (to none) that can sometimes occur at very high inclines, on the flip side though most would say it’s not quite as quick to install a bike on it every day. Rollers: Adding even more types you’ve got rollers, where you greatly increase the risk of crashing into your TV inside your living room. But they have a dedicated following and can actually improve bike handling skills (as well as improving your TV when you have to buy a new one). Phew – ok, now that we’ve got that out of the way, let’s talk about some of the more notable ones. Yes, I know, you’re supposed to love all children equally – but let’s be honest, some children are just better than others. Overall there are two trainers that I’d specifically focus on. One is at the high end, and one is at the low end. This is essentially their new top-dog. It’s also essentially a Real Turbo Muin with the B+ tacked onto it (and FE-C). It slides in at 1,290EUR, so definitely up there (in the same rough ballpark as the Wahoo KICKR and the Tacx Neo). It’s a wheel-off-design like in the past, but now includes the ANT+ and BLE transmission pieces baked in. Now this trainer is quieter than a Wahoo KICKR, but not as silent as a Tacx Neo (because that’s as silent as you get). Being it has FE-C it’s fully compatible with all the cool apps you want for controlling the trainer, but it’s also got broadcasting of ANT+ and BLE signals for apps that can’t or don’t have access to ANT+ FE-C support. Now in the provided papers you’ll see there’s also the REAL Axiom B+ which is very similar spec-wise, the main difference is that it’s wheel-on (and can’t do more than 10% grades – but you really don’t want to do that anyway). So basically you’ve got a small difference in price and you can decide which type of trainer you want. This may take the cake as the best Elite option out there for a budget FE-C trainer. At 394EUR, it’s the cheapest ANT+ FE-C trainer they offer, and on par price-wise (in Euros anyway) with the Tacx Bushido Smart. The trainer also supports the same ANT+ & BLE broadcasting options. It doesn’t include the REAL software suite however, but as I noted before – I think that’s OK. Note that they didn’t have one of these in the booth at Eurobike (because, you know, they have 16 trainers on offer and their booth wasn’t palatial), so instead I give you this picture of a bunch of trainers stapled to the wall. It looks almost like the one in the middle. 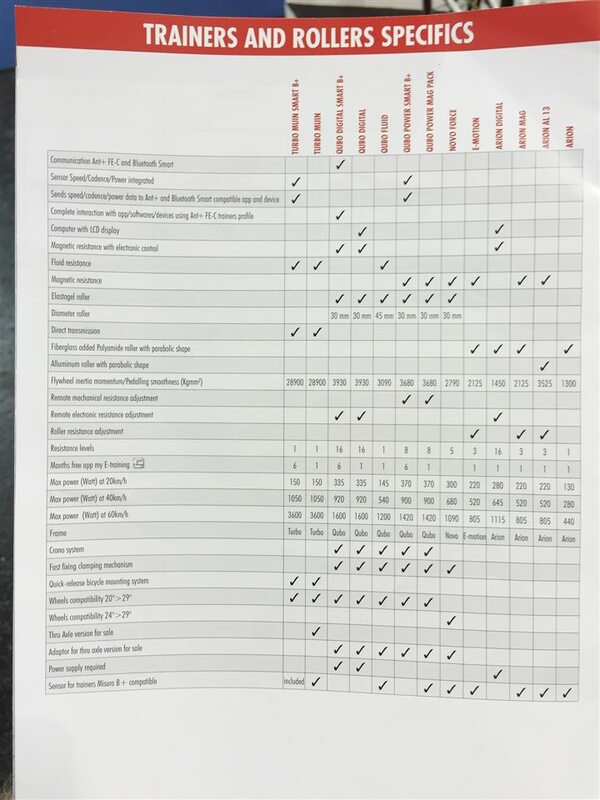 Now as I noted there are a crapton of other models, so in order to try and make your life easier, I’ve taken this nifty photo of the model comparison spec-sheet, so you can try and decode them all. Actually, I’m going to give you the entire brochure for full decoder capabilities. But again, probably best just to aim for the two models I’ve picked out. Finally – the piece you’ve all been waiting for: What happens to existing Real Turbo Muin owners as far as FE-C goes? Well, in a nutshell you’re going to get an update. Elite has promised that by the end of the year (2015) they’ll update the existing Real Turbo Muin to include ANT+ FE-C support. That means that you’ll be able to control it using 3rd party apps like Zwift and others. However, and I think it’s important to caution here – Elite also made this same claim exactly one year ago today. They said the Elite Turbo Muin would get ANT+ FE-C support by the end of last year. And then by the end of January, and then by late Spring, and then they said by Eurobike (now). So basically…it keeps getting pushed out. Now on the bright side I suspect that this is really a case of doing the software for the Elite Turbo Muin B+ (that’s the new model), and that software will basically just be ported over to the non-B+ variant (old model). Given the B+ won’t ship for another month (all of the new ones are roughly end of September, early October), I think that’s the cause of the delay. And since they’ll have to have FE-C done by time they ship the new B+, it surely can’t take another 2-3 months for the existing units update. But again, the proof is in the pudding. I like the approach that both Tacx and Bkool have taken in basically saying “go download the FE-C now, it’s available”, versus future promises. On the other hand – I definitely appreciate acknowledging a future firmware plan even if I don’t like the dates I get back. That sounds good to me but indoor training will still hard specially if you leave in a flat with the levels of noise from a trainer. Really can’t wait for the review for Tacx neo. 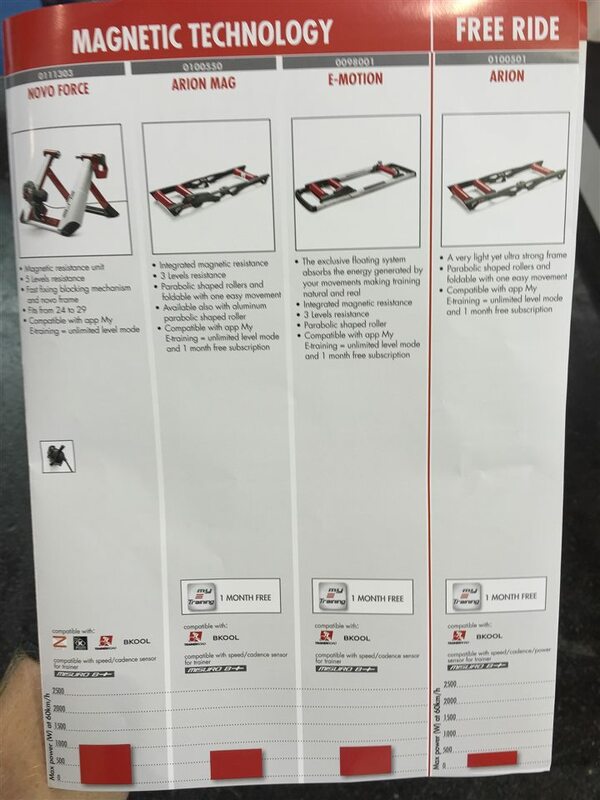 I’ve seen several reviews and even video comparisons of the Tacx Neo vs Kickr. Just search on – line. The Neo is much quiter. Almost much better looking, but that’s subjective! A lot more money as well, but lots of people are selling their Kickr and ordering a Neo. Ray, are you shooting to publish your trainer review at the beginning of November like last year? If so, does that mean you’ll have sufficient time to put the Real Turbo Muin to the test? I’m so interested to hear whether or not the trainer is accurate in its control of the power. Thank you in advance! So Ray, basically the RTM B+ over the RTM is basically just the case of adding Bluetooth capability? Did you personally see their RTM B+ being FE-C ready? I doubt it. They have mentioned in their FB page that the delay in getting RTM updated is because they are currently testing the new protocols and then they will proceed with the upgrade tool. I guess the further delay is due to them developing a tool to update the firmware. BTW, in the case of Zwift, they have confirmed that Elite’s B+ FE-C trainers are not currently supported as Elite doesn’t have Sim mode. TrainerRoad is more straight forward, as long as the trainers are FE-C ready, it just works. Chris, what do you mean by ‘Elite’s B+ FE-C trainers are not currently supported as Elite doesn’t have Sim mode’. What do you mean by ‘Sim-mode’? I’m thinking about getting one of these B+ models, but I would not do it if they don’t work correctly with Zwift and other apps. I Received an e-mail from Zwift on August 1 stating that they added beat support for the existing RTM. I haven’t actually tried it, since it is still summer over here in Europe. Im am very sure that im not the right person to be answering this. Based on my own user experiance, the current RTM works in Zwift ( Zwift is able to control resistance and obtain estimated power from RTM. This is done using the Elite’s private ANT+ protocol. So the new RTM B+ should work based on current support if Elite maintains this private protocol and adds FE-C and bluetooth. I suspect Zwift programers require sim mode in order for the RTM B+ to give power but the nature of Real trainers are they do not directly measure power. (Sim mode as in simulator mode in kickr). On the other hand, TrainerRoad informed that their app simply works with any FE-C trainers and they do not need to do any specific programming based on the various FE-C trainers. Same as Ray’s photo shoot of the brochure :-). however the Vortex Smart T2180 has a street price of approx €350. I was also comparing this to the Tacx Bushido Smart and price of the Tacx is a little higher. (€ 490 is what I found) Bushido says it has a 15% slope, Qubo digital only 6%, so I guess the extra 100 euro is the extra 10%. Another point is the Qubo uses magnetic resistance while the Tacx Bushido and Vortex are both fluid based trainers with brakes. The resistance is controlled via a motor brake in the bushido and via an electro brake in the vortex. When electronically controlled resistance is not in use, the Fluid based trainers have the advantage of the resistance increasing as the speed of the rear wheel increases. I cannot wait for Ray’s 2016 trainer buyers guide. There are so many new options in the high end I’ll bet Ray will need to split the high end into more categories. Personally I want an option that better simulates hills than my CycleOps Fluid ² trainer using Trainerroad and a power meter. I’m just not getting the same low inertial load feeling I get when climbing hills at 8% or greater or even 6% once I crack. I’m hoping a smart trainer with an electric resistance unit will be able to simulate the low inertial load we get on hills. Can any of the new breed of affordable high end trainers do this? Ray, what do you think of the build quality of the Elite Qubo Digital Smart B+ vs a TACX Smart Vortex? My original intention was to buy the Vortex until I saw your warning about waiting after Eurobike. I have not yet seen either one in person so I can only say that I like the Qubo’s design (it also looks like it has more metal vs the plastic on the Vortex). I’m guessing that these two should be similarly priced/featured. Since they (Elite) didn’t have that one on-hand, i can’t say for 100% certain on the build quality. 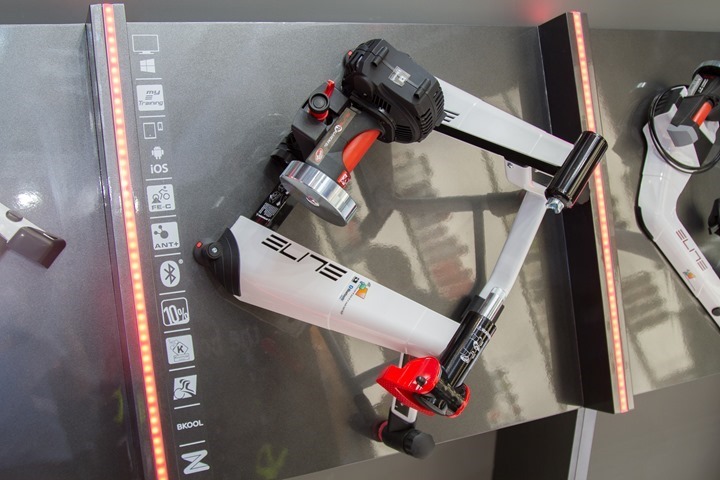 That said, I assume it’ll be similar to it’s siblings, so I’d put the build quality at the good but not rock-solid level of the heavier units (Elite RTM B+ or Tacx Neo or Wahoo KICKR). But I also haven’t heard of people breaking their units either. Do you know if the existing Qubo Digital’s will ever get an FE-C upgrade? Rollers increase the risk of crashing into you tv ?? lol. From personal experience unless the tv is within touching distance of the rollers it ain’t going to happen. You have zero momentum, when you come off you come to an awkward and painful stop – which is exactly like in real life so whoever said rollers were a more realistic option was really on the money. Any idea of their new pricing structure yet? Would love to upgrade my old Cycleops unit, which I have had to replace the fluid resistance unit on twice now. Thankfully all covered under warranty. Can speed, cadence and power data be transmitted directly from garmin edge 520 to my e-training app via bluetooth smart so that you don’t have to use ant+ adapter? Ray, I just found the Elite Volano while browsing the interwebs. Looks like a compact version of the Muin. Is this something that you have heard of? Great post, when will you be publishing your eagerly anticipated 2015/16 trainer recommendations article? Looks like I’m waiting a few weeks to make my purchase then. I’d be stupid to spend the big bucks on a high end trainer without your wisdom on the latest available. My thoughts exactly JP ! I have no clue what to buy 🙂 This has become a very complicated market. Last year was easy my friend was injured and I got to use his kickr all winter. This year I need to get my own. Is there a big difference between the Elite Turbo Muin B+ Modell 2015 to 2016? Elites forum / customer service is both very slow and very poor, the product when it works is a very good simulation of ride feel. I honestly believe they released the RTM before it was ready for market, the support , software and integration with other products is poor. I also believe that they wanted to create an exclusive all in one package of trainer and software that covers everything. Realizing that they failed to do so, made them re think the design to be both update able and allowing integration into other software/hardware connections. This is great for people buying the second phase B+ model but horrendous for anyone who has a RTM that is not update able. I agree – I’ve got Real Axiom Elite Rollers and whilst now they are great, the support and issues early on were never ending and very disappointing. Basically they had an internal wiring issue causing shorting out which they couldn’t suss out. The software is also incredibly sensitive to any other programs running on your laptop and crashes until you get it up and running. Great system to ride let down by the manufacturer and silly design/build and IT issues. TURBO MUIN: not upgradeable to ANT FE-C, no resistance control, correct? TURBO MUIN SMART B+: upgradeable end of year to ANT FE-C, so will have resistance control? So if the above statements are correct, the MUIN SMART B+ when upgraded will be the cheapest direct drive ANT FE-C compatible trainer? And compatible with Trainerroad/Zwift for cadence/speed/power/heartrate? What is the difference between Turbo Muin and Real Turbo Muin? The main difference between Turbo Muin and Real Turbo Muin is that the latter has variable resistance at constant speed (i.e., if you maintain a steady 20 km/h speed, you can generate a range of power from a minimum of 70w to a maximum of 850w). Very interested to hear your result. I mainly want to use it with Trainerroad, would also like to know if they then broadcast speed and cadence over ANT+. In that way I would get everything in Trainerroad, and virtual power off course. Just have to check if Trainerroad supports it, with resistance control. in fact you can broadcast speed, cadence and power with the b+ version but that’s it. I own the real muin, without b+. I am not disappointed at all they updated it. I have a stages to give me power and cadence, and a garmin GSE10 in manual mode taking to speed from the muin flywheel. All this and my heart rate are sent to my garmin. my sensors respond quickly and are reliable. The muins cadence was poor. I often set the muin to do power / time. I think it controls this very well. When I check strava and look at my sensors data, the power from my stages is flat lined at a perfect trace until a step up or down in power, and it then has about her perfect trace. I think my setup will work better than the b+ to be honest. I wanted my stages anyway and the speed sensor cost me £10. I’m currently using the muin at set power levels to increase my FTP. Do you find the power to be consistent Simon? I have a vortex and ended up buying a stages as the power is that unreliable. it would be nice to have a trainer that give consistent power every time, there will always be variations between different meters, but 200watts today should be 200watts tomorrow, with my vortex the variations are massive. Ray, any chance my elite qubo digital from 2013-2014 will get ant+ fe-c and work with garmin 520? Does the new version of the elite muin b+ have FE-C? Or is it just the real muin? DC Rainmaker is confusing the models. There is Muin Turbo (two versions actually), Muin Turbo Smart B+, Real Muin Turbo, Real Muin Turbo Smart B+. Muin Turbo, second version, is simply Muin Turbo Smart B+ without the Minsuro B+ sensor. Neither of these will ever have resistance control — they don’t have the resistance unit externally that mounts on the left side of the fluid unit. The first version of Muin Tubo has the magnet on the flywheel. You can use the Minsuro B+ by mounting onside on the flywheel case with double sided tape. Muin Turbo (second verison) and Muin Turbo Smart B+ has the magnet on the cooling fan — you stick the Minsuro B+ in the little chamber they created at the bottom of the fan cover. Hmm. Where in the post is it incorrect (so I can correct)? You wrote “They said the Elite Turbo Muin”. You probably meant “Real Turbo Muin” (non-smart b+). This is the first version in the “Real” line of Turbo Muin. The original Turbo Muin does not have resistance control — the control unit has an extra chamber on the left. There is no way this can be upgraded to FE-C (I have one — wish it could be because I would have gotten a real good deal.). The non-“REAL” qualified Turbo Muin’s don’t have that chamber. Ray, are you going to deep test the Real Turbo Muin B+ any time soon? What’s you opinion on this one? You said it was not as silent as Neo, but it seems like 30% cheaper than Neo now. Would like to see a full report on the Real Turbo Muin B+, especially a sound test. Looks like the Neo is having issues….based on reviews by your readers…so am thinking this may be a better choice. Thank you. Your fan (alone), music and breathing drown out the RTM. Does anyone know of a good place to get the new Elite Real Turbo Muin B+ in the State? I don’t see anyone selling it on-line except overseas. That gives me some concern on their ability to support it too. Just to vent- why does Elite make their Muin model names similar and confusing in trying to find them? Pronet in WA just had a shipment arrive today. You may want to try them. They are selling quick! Eric, I’ll bite, you are connected with Pronet I take it? If so, I have some questions for you. Thanks. I am not. I just happened to order one this morning. It’s already been shipped. I only know what the Elite website has provided. I went with this unit due to living on a top floor apartment. I’ve been intrigued with this trainer since before it was the B+, I was just waiting for that functionality to be included with the trainer. I always surmised that this would be end up being better than the Kickr, but to date, Ray has not provided a full review of it. That’s all going to change when he releases this year’s trainer review guide and I can’t wait to read about this trainer. I applaud you for taking a leap of faith with this trainer. If you don’t mind sharing some of your impressions with the rest of us when you get the opportunity, I know it would be greatly appreciated. I know there are others still sitting on the sidelines waiting to see how this and the Neo fare compared to the Kickr. I have been using the RTM since August this year and before that the TM. The Muin (regular and real versios) are really built like a tank and very quiet. As for RTM, if you plan to do serious training and virtual race/ride on zwift then it is worth the investment. (Or TR for FE-C protocol ready units). Elite’s own software will make you cry. I use RTM with a power crank on zwift. Thanks Chris. Do you use your RTM B+ with TrainerRoad then? If so, how does it perform with that application? If you could post a sound recording of the B+, when you get it, that would be great. Thank you. How have you found the elite trainer Eric? So far so good. It is quiet and perfect for the apartment. My next door neighbor couldn’t hear it at all but I haven’t inquired my neighbor below me yet. I’ve only rode it one day though and used Zwift. I played around with the Elite software and a little bit with BKOOL. They all had a hard time connecting at first but when I unplugged and plugged back in the doggle it paired fine. The biggest issue was the PC only compatibility. I have a MacBook so I ended up purchasing a Windows key and the Parallels software. I’ll use it again Thirsday with the scheduled rain coming in on Thursday in Texas. If I did read well, I understand that Edge 810 does not work? I was wondering if RTM smart B+ software Works on a PC Windows 8 or 10? Is the ant+ dongle inclusive? I assume that it has is own speed/power/cadans inside, so I don’t need a meter on my bike? I am on the previous model (without the B+) i was using TR in regular mode with power switched off. (In order to get a small % of slope and a bit more resistance, turn on the RTM and after the magnets move into position with the vibrating sound, i turn off the power) with this setup, i can do intervals of up to 500 watts. I changed today from turbo muin 2014 to muin 2016 because my TT Bike didn’t fit on the old one, now I’vegot a New problem: my Misuro Blu+ Sensor is Not capable to be used with turbo muin 2016, on elite Website There is only misuro b+ left, no blu+ any more the manual tells me to Flash the led Light 13 times, but blu+ can only blinkt 10 times, does anyone have an idea if a softwareupdate is possible? Hi there.. I want to buy a new Indoor Trainer which support all technology to made me actually use it 🙂 (I have 10 years old Elite, which is so boring to ride in the living room). I saw first Tacx Vortex Smart, but i found out a lot of quality problems on the net (White Smoke, and need of replacing of the motor). Also im a bit in doubt if 7% sumulated slop is enough for the climbing simulation that i plan. Then i come to Bushido which is better in Climb simulation, but also a lot of quality problems from the users on the net (even more compared to Vortex). Here’s the thing about problems on the internet – if you search for problems, that’s all you’ll find. In other words, 99.99% of happy users never go on the internet and post as such. Whereas seemingly 99.99% of unhappy people do. So everything is lop-sided. Happy people don’t go to forums and post about non-problems. Also, be sure to separate software from hardware failures. Finally, remember that far fewer people use Elite controlled trainers than Tacx, and as such there’s less detail on it out there. As for your selection. I don’t find a ton of value in simulating downhills, but I think 6% is a touch low, whereas 7% is just a bit enough. I know it sounds like a tiny bit, but I see more 7% hills than 8% ones. How this 7% simulation (On Vortex), or 10% (on Bushido), Compare to my real world climbs (7%-15%). Also i checked in meanwhile BKool Pro Trainer (Up to 1,200W. Can simulate gradients over 20%.) What do u think about this trainer? Seem pretty sturdy, simulate climbs up to 20%, and seem that is compatible with a lot of software? And i agree about that that most of the time unhappy people post about issues..
You wrote: “…ANT+ As a result it transmits ANT+ Speed/Cadence/Power, and Bluetooth Smart Speed/Cadence/Power. This means you can pair it to basically any Garmin devices…” but I can’t pair my new Elite Qubo Digital Smart B+ whit my Garmin 920xt. Elite Qubo Digital Smart B+ transmint in ANT Fe-c but Garmin 920 no! It seems only Edge 520 can be paired whit these trainers. Have you tried whit other Garmin devices? I use the elite turbo muin smart b+ with my garmin edge 810. At first the garmin did not recognize the misuro b+ sensor but after placing the garmin next to the misuro while moving the pedals with my hand, both devices connected. After the first handshake the misuro b+ was always recognized by my garmin edge 810.
i have the same problem here with the top model (elite real turbo muin b+). tried to pair with garmin edge 1000 and garmin 920xt… the elite doesn’t appear in the sensor-list. already deleted all other devices in the sonsor-list of the garmin. didn’t help. the strange thing is that the communication with the pc with the ant+ dongle works fine. so there IS an ant+ signal. so i just wrote to the elite support. hope the can help. ok… just found the answer here at the 520 review. it’s because the 920xt doesn’t support ant+ fe-c. for the edge 1000 will be an update (q4 2015) but i don’t know if there will be an update for the 920xt. what i don’t understand how hein got it work?? because the 810 doesn’t have ant+ fe-c support (and won’t get)? The problem is that the RTM B+ doesn’t transmit on ANT+ in the standard SPD/PWR/CAD ways, but only via FE-C, which is only supported as noted on the Edge 520 & 1000 (soon). Initially I was under the impression that because it had the ANT+ logo it was transmitting on those (and on BLE it is), and with the Misuro it is too, but not the other ones apparently. Super-confusing. I’m just adding a line to clarify that in the post. Sorry for the confusion, as Elite had also looked over the post shortly after publishing and didn’t say anything was amiss. Garmin 920xt doesn’t implement the protocol fe-c; Elite support confirmed that B+ models transmit only that way. In my setup the misuro b+ is recognized as a powermeter. I can read the virtual power on my garmin edge 810. It works. However, I cannot control the elite trainer from my garmin. (But I don’t care, because there is nothing to control on the ETM – no real). I’d like to see the trainer as sensors. I don’t care control them, tI do it already from the iPhone already. Maybe it is better to write a mail to info@elite-it.com and tell them about your problem. When I was facing a problem with my Misuro B+ they where of great help. Just to confirm, the Misuro outputs “virtual” power over Ant+ that can be seen on the 810 ? Hi Hein, just setup my Elite Turbo Muin with my Garmin 810. What settings did you put into your garmin as I’ve based mine on a 2096 (700×23) wheel circumference. The output seems a lot lower than the effort I’m putting in. I have the same issue with Garmin connectivity. 510 model also using the real B+. Keep me posted with anything you here from Elite. It also took some time to connect. Strava and bkool both had issues to start. same here… 510 has no ant+ fe-c support. Does anyone know if I have to purchase the Ant+ dongle and lightning pin adapter for the iPad mini for the RTM B+? I’m looking for a cheaper alternative than the $90 Amazon provides. Perhaps purchasing a BT HR belt would work in order for it to be utilized with the Elite app? I don’t have a problem with Zwift etc and a Garmin HR monitor due to the PC dongle. the ant+ dongle is included if you purchase the rtm and it recognizes my ant+ garmin hr belt with no problem. 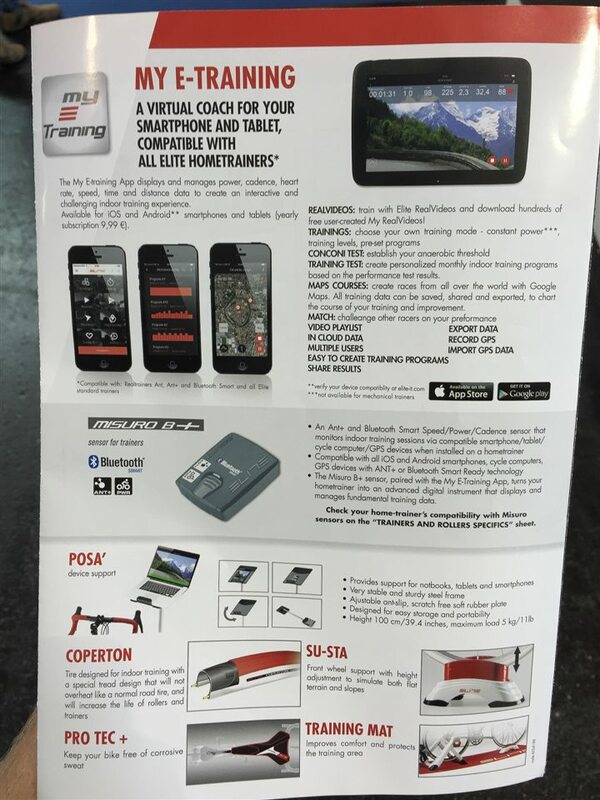 for the ipad you can use the “myETraining” app which connects via bluetooth. Thanks for the reply. Unfortunately I think the Garmin HR belts aren’t compatible. I believe they are Ant+ only so I’ll either need to buy the dongle for the iPad or a Bluetooth heart rate monitor. My E-Training app can receive signal from ANT+ or Bluetooth Smart HR belt. yes, you’re right. if you want to see the heartrate on your ipad you need the ipad dongle or a bluetooth hr belt. the dongle which is included is just an usb dongle for pc/mac. but if you would use a laptop (not the ipad) with the elite software oder zwift or trainerroad or bkool or whatever you can just use the garmin (ant+) hr belt. Thanks for your correct response. I purchased a Wahoo BT HR belt and it works great with the BT iPad and Computer (w/ it’s ANT+ feature). Did anyone try the RTM b+ with trainerroad here? I am trying to connect Trainerroad to the RTM b+ via bluetooth using an iPhone 4s. The app sees a device which is identified as TM but only shows Cadence and Speed, no power (see picture). The speed is also completely off….looking more like power values. Remember that the RTM B+ doesn’t allow 3rd party apps yet to control the power level, only via ANT+ FE-C today. Soon it will enable that for 3rd party apps via BT, but none have implemented it to my knowledge. As for why you’re missing the power side…not sure, should show. Thanks for the reply. So when you tested it (using FE-C) and posted a picture on Twitter, it was not controlling resistance, just showing power. You were using a PC, right? I was using the desktop app, which controls via FE-C, using my ANT+ stick. Always enjoy your in-depth insights and many thanks for your efforts! Elite do indeed make it very confusing with their names and apparent product updates which may be ahead of their website. 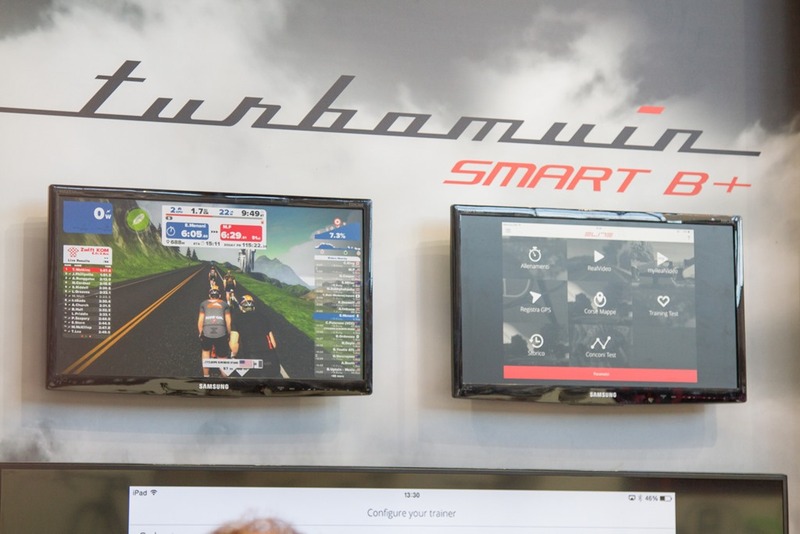 The Turbo Muin Smart B + (not the Real TMB+) looks like an interesting contender for a smooth ride at £340 in the UK (Tacx Bushido Smart level or Vortex Smart +£80). I think I have understood that this either has or will be getting ANT + FE-C control enabling resistance control via yours and third party apps. Is this correct and when is it available? What does Smart really mean? I appreciate that this would not work with my Garmin 810 for uploading data to Strava etc. however there must be a way to export the data from the main 3rd party training apps into Strava? I haven’t started with these yet so have no experience. Smart B+ is a new version of sensors included. You don’t want the old version anyway. Many thanks for clarifying Greg. So “Smart” isn’t really very smart in this case! Back to plan A (Tacx) it is then. I would prefer a direct drive/wheel-off model however the smart ones are way out of my price bracket and non-smart just doesn’t seem to make sense any more. 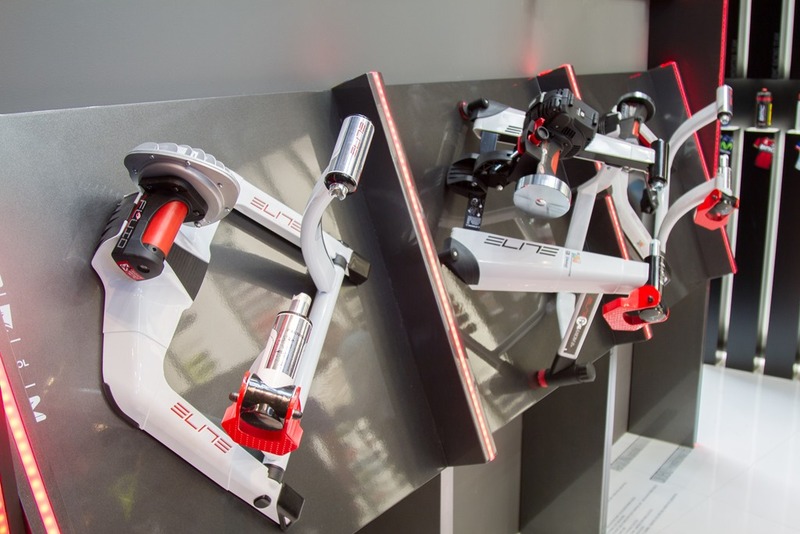 Trying to select between the new Elite RTM B+ and Tacx, a lot of good information here, thanks. Another question, on the Tacx web site and Elite, they mentioned that we can import data and ride a particular route, with the profile etc, but on the Tacx they mentioned that a license is required, nothing about that on Elite web page. I can see that it is the same thing for the web races, a license is required on Tacx server but nothing about it on Elite side. 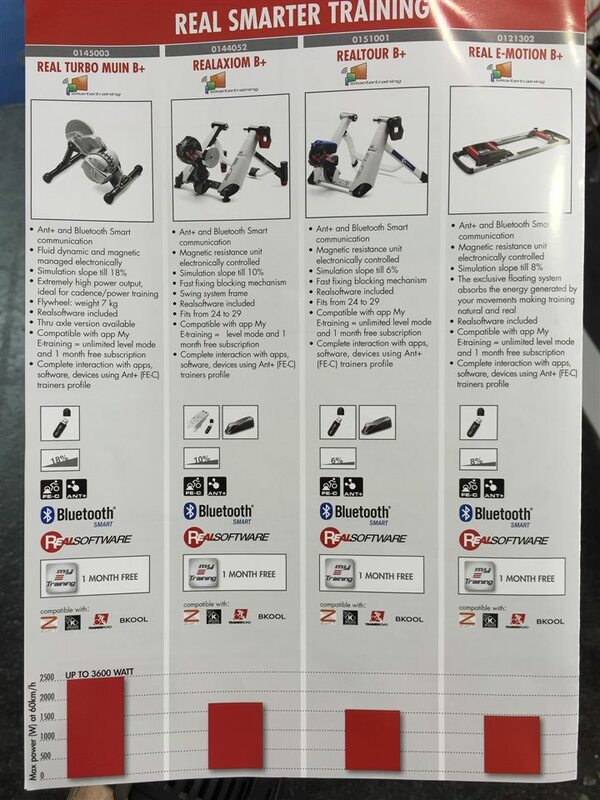 Any difference on these features from them or we have to take in account that there is fees with Tacx ? A lot of interesting apps on the market but the trainers cost a lot, would be nice to avoid monthly fees after that. My E-training has around 12$ annual fees which look respectable !! Do you have any info on the new Elite Volano/Roteo?It’s not even on Elites website but can be had on the net for £300. I’m tempted to buy it if it’s got an internal magnet in the fly wheel that a 3rd party speed sensor would pick up. Hmm, nothing on those. Sorry! I find it bizarre how a company can release a product with absolutely no information on it and not even have it on their website! Its not possible to buy the Turbo Muin or the new Volano for the same price £300 both take the Misuro which outputs “power” on Ant + ( I believe) is there any reason to go for the Turbo Muin vs the Volano ? Anyone tested the accuracy of the Misuro compared to a real power meter ? Where can I buy the Elite Real Turbo Muin B+ in the USA? I cannot find it online for sale in the US. I wrote to a couple of companies in Europe and they wont ship it here, they told me I have to contact a distributor in my country. I cannot find reviews for the Elite Real Turbo Muin B+ , specially compared to the Tacx Neo. I had so many headaches with the Neo, and Im considering now to get the Elite Real Turbo Muin B+. You mention the digital smart b+ will work with the Edge 1000, yet I’m struggling to work out how to connect the two, do I need to purchase something additionally? The Edge 1000 hasn’t quite yet had the firmware released yet that adds ANT+ FE-C.
Firmware update for real trainers (ANT+ FE-C) testing phase to be released from 7th January 2016. Official release on 25th January 2016. Thanks Chris, do you know if this will allow the edge to both record distance and also change the resistance of the digital smart b+? (Though, to be clear, most B+ trainers already have FE-C support in them). Will you do an update on the Elite trainerns now that they supports FE-C ? But there seem to be a big error in powerreadings would be interessting to se these powerreadings compared to som real PM like vector och P1 pedals. Actually, their units released this past fall did have FE-C in them, so that’s what I tested with the RTM B+, and the lower priced unit I included in my 2015 Trainer Recommendations. Elite Volano – can’t find any reviews online and no mention of it on their website – very odd. Will the Misuro sensor work well with it? Will it be accurate? Qubo Digital Smart B+: Any reviews? What’s the noise like? My only comparison is a Tacx Blue Motion which is OK at low rpm than gets quite noisy when you put a bit of speed down. It says on their website (link to cdn.elite-it.com) Qubo Digital Smart B+ does up to 6% gradient but it isn’t listed as ‘real’ product. How does that work? Any links to best prices in UK / Europe for either of these? My top two priorities are low noise and real interaction (closely followed by price of course)! Many thanks all – have a great New Year. Hi Ged. I just ordered Qubo Digital Smart B+ to be use with TrainerRoad. I will update later to see how it goes. Best price in UK can look at Evans Cycle and TFN. I recently bought a Qubo Digital Smart B+. Bargain price of £238 from ribble cycles in the UK. I got it so my son and I could use Zwift easily given our bikes have different rear wheel sizes and the Qubo frame allows quick swaps between our bikes. First ride I did on Zwift and I noticed a huge increase in the power values compared to what I see in TrainerRoad with my other turbo. The TR setup is a Tacx Flow (+3 incline using TR virtual power). I had recently done an FTP test in TR using the Flow setup so I fired up TR last night and did a test with the Elite Qubo. I used the new desktop beta and it didn’t seem to have the spindown test so I just went ahead and did the test. I wasn’t expecting such a massive difference, perhaps 5-10%, this is more like 30%. I wonder if Ray would think this is justification for a replacement from Elite? In reality I think my FTP is somewhere in between (closer to the lower value as the Elite value puts me in pro contract territory!). I know the virtual power set up seems to get less accurate as the power gets higher. For example, I’ve never acheived more than 600W in a sprint on the Flow but have managed 1000W on a Wattbike in jeans and trainers at a bike show. I guess I’ll probably get myself a power meter next so I can get consistent readings across both trainers. Then use the power match features of TR and Zwift to be able to use Elite trainer as an ERG trainer. In summary, a bit disappointed with the power readings but other than that the trainer seems great. I tired Qubo Digital Smart B+ & powertap with trainer road. It didn’t work well at all. I returned the Qubo, may have been a faulty unit but didn’t give me confidence. In this new world of smart trainers I think its important to be with a big company that will be supported and give good tech support when required. I’m not sure Elite is a great company especially for support. Its a nice, quiet well made unit which has a lot of potential. Will be interested to see how you go. Qubo Digital Smart B+ is now available in Europe for 252,- € plus VAT, or 299,- € (Germany). Mostly sold out. I ordered one and will update you all. Would like to use it with Training Programs and Video and maybe later use it together with a SW to influence resistance based on a registered Video or/and gps route. I have Edge 810, 920XT, Fenix3, PC with Windows 10, iPhone 6s and an old iPad 2 which i was thinking to use and transmit the training onto my Garmin Connect Account. I’ve been trying to fix my crazy high power values broadcast from my Elite Qubo Digital Smart B+. It seems to think i’m a pro cyclist with a 5W/Kg power to weight ratio. I’ve contacted TrainerRoad support who told me that doing a ANT+ FE-C spindown calibration in their software would write new calibration values to the trainer and therefore fix the problem in TrainerRoad and Zwift as well. So I tried, first in their new windows desktop app, that didn’t present me with a spindown button after connecting to the trainer. I did get the option in the older classic version of the desktop app but it just hung waiting for a response from the trainer. I also tried VeloReality VRide but that also just did the same thing, hanging waiting for me to start pedalling even after I was doing 50 kph+. I tried using Elite’s own myETraining android application that connects via bluetooth. That did show me some calibration values (labelled p1, p2, p3!) but no idea what to set them to and no option to do a spindown test. My guess at the moment is that Elite haven’t implemented the calibration part of the ANT+ FE-C device protocol. I downloaded the ANT+ FE-C spec and it says that it’s an optional part of the device profile. Perhaps a firmware update might fix it? No idea how to update the firmware on the trainer. No option in myETraining but there seems to be a diagnostics jack port at the back of the brake unit. Has anyone tried the Elite iOS apps? Perhaps there is something in there? I’ve got support tickets open with TrainerRoad and Elite so i’ll post back any further information. At the moment, i’d say this trainer is only good if you don’t care about realistic power values (enjoy the Zwift KOM’s) or if you can use it alongside a decent powermeter. Otherwise I wouldn’t recommend it as your sole source of power data unless you want 100W for free on your FTP! Got mine today and have the same issue… if you find the right numbers for P1,2,3 let me know. I have a Powermeter on my bike and in the App on IOS i see 100W and on my Bike measured 60-65 W.
Got a reply from Elite and TrainerRoad. I’ve included the one from Elite at the end of this reply. Basically it doesn’t support calibration yet and won’t for some time. The TrainerRoad guys say the same thing. From what the Elite guy says their formula should be more accurate the more power you put out. Doesn’t seem that way to me. I have no ideas about the calibration values in their app, not going to touch them after reading their response. Interestingly, Ray made comments on the 2015 trainer recommendations post that he saw good power data from the one he tested. Find this strange as I reckon I’m pretty close to him stats wise, i’m 71kgs, 9kg roadbike, turbo tyre at 100psi so it’s not like I’m doing anything unusual. BTW: Do you use TrainerRoad? If so, does TR’s PowerMatch feature work well in ERG mode with your power meter and the Elite? Bit worried that the TR won’t be able to smooth out such a big difference in power between the two devices. I’m thinking i’ll buy a power meter to get consistency between my two turbos and use constant incline in TrainerRoad and in Zwift let it control the incline only but take the power from the power meter. I’ve been looking for an excuse to buy one anyway, will be nice to have the data from outdoor rides too. unfortunately the trainer doesn’t measure the power but just calculate it with a math formula. Normally the error is bigger at lower resistance ang gets lower as soon as the power increases. in fact when the power increases the influence of these variable gets lower. Unfortunately at the moment we haven’t a calibration procedure. We’re working on it but it won’t be available soon. That’s the reason why the calibration with the other software doesn’t work. Fwiw my tire pressure is typically 120psi and about 20 pounds more in weight. I found it fairly accurate when sitting, but during sprints where I stood, it went a bit off. This was a seated 20min FTP test on TrainerRoad, It gave me an extra 100W on my FTP from a previous weeks test and calculated me at 5 W/Kg for an hour! That’s way to high for me. I’m less than 4 W/Kg over an hour at the moment. Be aware that Zwift currently does not do Powermatch. Trainer Road didn’t work using powermatch with my Qubo. I gave up an bough a Snap and am very happy. I was not sure what to do with the Parameters in the App which are P1,2,3 and on a Forum i found that it seems to be numbers used to influence power (or the formular). P1 is for high climbs, P2 medium climbs and P3 flat (no climbs). If the power reading is to high (the resistance to low) you have to decrease the numbers to get more resistance … Thats whats written and i will try tomorrow. I do not use any other App yet then the Elite my e-training App. That sounds interesting. Do you know if it stores these settings in the app or writes them back to the trainer? Could you post the link to the forum topic you found please? I did test yesterday the P1,2,3 Parameters by setting them much lower and nuch higher but i think nothing realy changed a lot. The Watts communicated by the Qubo are still much higher and this does not change with different seating positions. With Zwift, which i installed on my PC i had the same issue. The Watts are way to high on Zwift in Comparison to my Power2max Powermeter. The Speed is a few Km/h off to but much more in line as i do not trust the garmin speed sensor either 100 percent. So fare it works with the my e-training app and Zwift but the powerreadings have to be adjusted which means the algorithm which is calculating it on the trainer. Do other trainers have the same issue or is it just the Qubo Digital Smart B+ ? A quick update on the firmware update (to FE-C) for RTM. After installing the firmware update, and getting the new version of the real software and myETraining app, everything works really well. The app has been redesigned and works really well. 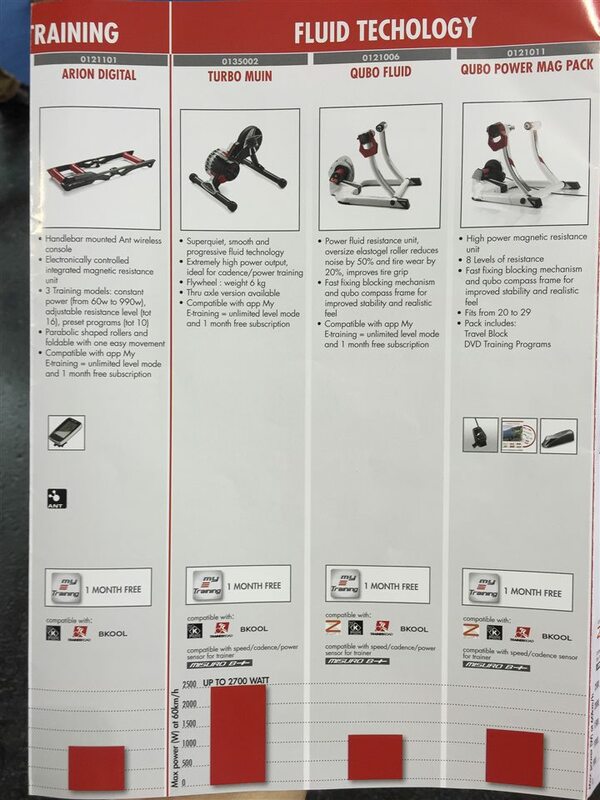 On zwift, power, cadence and trainer are paired to the trainer (or a separate power meter and cadence sensor) and there is ERG mode in workout mode (with power paired to trainer). Overall a vast improvement on resistance control with the FE-C. Resistance now changes not only in accordance with the gradient but also takes into account wind resistance i.e when sprinting. It is amazing how a better software can make a world of difference to the performance of the trainer. With FE-C, RTM B+ must be one of the recommended high end smart trainers. I bought a RTM B+ when it became available in Canada.I found the price difference between the RTM B+ (1350$ CDN) and the Wahoo (1680$) and Tacx (1800$) to be significant. I have to admit that Elite customer support could be improve a lot but overall I am really happy with the trainer. Having never trained with power before, I really appreciate getting a number to work around and not having to use perceived rate of exertion or simply heart rate. Speaking of power measurement on the Elite RTM B+, I was wondering if anyone had compared the readings with a real power meter? My FTP does not look too crazy but I have no point of comparison. Also, can anyone tell me where I have to look to check if there is a firmware update available for the trainer? RTM B+ should be running the latest firmware already. I noticed the climbs in the Elite real video app to be easier than they should be. However, I am using mainly trainerroad now. How much confidence should I have on my FTP is evaluated using the TR 20-min test and the RTM b+? The power you see is estimated. So your ftp is also estimated at the moment. Best if you could get a power meter ( ask a friend with power meter to ride on your rtm anc do a power match on TR ) keep this setting for your future TR sessions. It is still estimated power. Did some more testing and a workout with Zwift yesterday. The Elite Qubo Digital Smart B+ i have shows basically 100% more power the there is in reality on my Garmin Vector Powermeter. I had to turn the Power to 360w on the Elite App to get an output of about 199-200w on the Powermeter. I changes weight and the P Numbers, tire pressure, seating position but nothing really changed. Sounds like you had a similar experience to me although the difference on your trainer is even higher than mine. Like Bob above, I sent the Qubo back and should get my Kickr Snap delivered today. It was £200 more than the Elite but it’ll be worth it if it’s more accurate. I’ll post back when i’ve tested it. Have you tried pairing your power meter with Zwift as well as the Qubo and letting Zwift control the incline on the Qubo to simulate hills? I tried this with a borrowed power meter before sending the Qubo back and it worked pretty well. Unfortunately, not all training apps support both a power meter and a controllable trainer which is why I sent it back. Had the Kickr Snap for a few days. I think sending the Qubo back was the right thing to do. The build quality is really impressive. The power figures seem accurate and reliable. You can sprint out of the saddle without losing power. It can simulate massive gradients, I had a great ride up Alpe D’heuz today on Virtual Training and it could easily simulate 14% climbs. It’s also really smooth. Only problem i’ve found so far is it wasn’t accurate straight out of the box. I needed to do an advanced spindown calibration which is only supported in their iOS application. Luckily I have an old Ipad otherwise it would be pretty annoying. It’s a one time only thing to set the power of the brake, after that I can do a normal spindown in all my other android/pc apps. -If I wanna ‘play’ Zwift, do I need to buy extra accessoires or can I connect with Bluetooth? C) Cannot use BT with Zwift, so you’ll need an ANT+ USB adapter. “Hello, I’m in the market for an Elite Turbo Muin trainer. There is a lot of confusing information regarding it’s ant+ capabilities and I would like to get a confirmation from you. I want to buy a “ELITE TURBO MUIN ANT+SMART B+MISURO B+” wich my shop in Poland lists as product no TRE000037 . Every app or device that use ANT+ or Bluetooth Smart can receive from the Misuro B+ the data mentioned before. I would assume, this means that Fenix3 can comunnicate with the trainer. Am I missing something? Please anyone, could clarify it? The TM smart b+ is a fluid trainer and it is non electronic aka dumb trainer. I think elite has confused alot of people with its naming of its products. For Elite, their electronic trainers are named Real followed by the model name. Turbo muin b+ will broadcast via the misuro b+ estimated power, speed and cadence to any ant+ device i.e. garmin and zwift. I use Zwift also via BT… Their App has an Option to activate it… Means you need the App running and then it works also via BT. But i just can say this for iPhone if it works on Android and the same way I don’t know. Right, but Zwift doesn’t control BLE trainers at this point, just receives data via the standard power/speed/cadence HR channels. So in his case, it wouldn’t control it. The My-realtrainer App from Elite does also the settings via BT so I thought thats also the case with Zwift… I had both active so it used ANT for the changes and BT just for the App readings ? Yeah, that uses a private BT connection to the app – not an open standard. Hi, I note the Qubo Digital (latest model) has FE-C capability. I have a Qubo Digital but it is an ANT+ model seemingly rolled out before the FE-C option was available. I would like to use a third party training program, something like TrainerRoad that can control the resistance levels on my trainer but at present I don’t think that capability is possible with my model. Do you know if Elite will be rolling out some way of being able to update this model with the FE-C or is there another workaround solution? On January 25th, we’ll start releasing the upgrade tool for the protocol of ANT REAL trainers to ANT+ FE-C. The ANT+ FE-C protocol is an open protocol used from the most 3rd part cycling software available on the market (as Zwift, TrainerRoad, Kinomap Trainer, etc…). Once upgraded, the Elite Real trainers will be compatible with most of these software/apps. If you wish to participate to the testing phase, contact us at real@elite-it.com indicating the name and serial number of the trainer. The testing phase will start today and the release of the upgrade tool to the testers will be progressive. Only the ANT Real trainers with “firmware upgradable” sticker are eligible for the upgrade. The beta test phase for Qubo Digital / Arion Digital will start about 2 weeks later. Thanks for that Ingo. I contacted Elite directly but they didn’t give me as much information as you’ve just provided they suggested I just contact the 3rd party software provider. I’ll watch this space and wait for their rollout though they’ve missed quite a few dates in the past. Here’s hoping. I’m about to pull the trigger for a smart trainer. 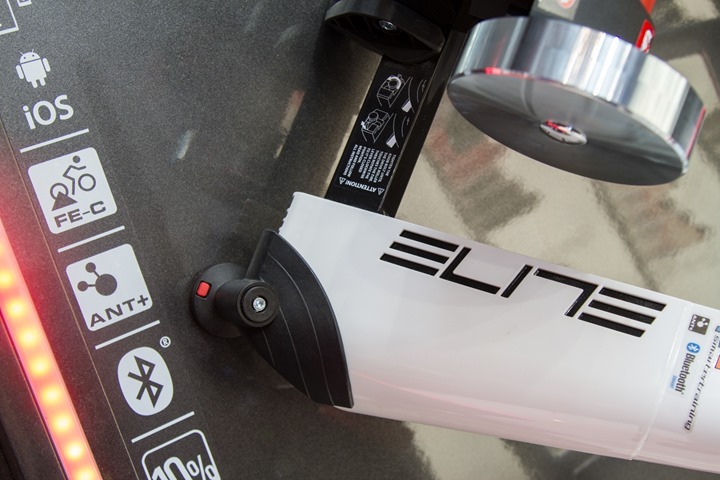 Neo seems just being not available until days become longer and warmer… so I may jump on an elite smart turbo muin. Actually I’m a bit worried power controlling is somehow inaccurate (referring to the German Tour magazine tests published 12-1015. does the trainer support any calibration procedure and/or powermatch function in TR or other app/software? Damn… I do have a powermeter, so I may correct for any under- or over-estimation, at least if the error is systematic. Or simply wait. Elite does have calibration tool to match the PM in theory. However that calibration is only effective when running their own training software. However, currently they just release beta calibration tool that is supposed to keep those calibration values into the firmware of the rtm fe-c. However, i find that the calibration values when entered into the firmware messes up the resistance in zwift. It becomes harder than real life. So end up i have to adjust the values in order to experience realistic resistance. Needs alot of patience with this product but once u get it , it is quite a good product provided you use it with a power meter. So do you mean it is then (once calibration is properl’y done) usable without pm with a good accuracy? The calculated power is on the high side especially when climbing (on zwift) Expect to see 30-40 w higher average power when using rtm calculated power. However it is consistent. Thanks for your input Chris! So basically not that accurate. Bummer. There is not such a tool for the Qubo Digital Wireless B+ as i know. There are some P Values in the app but changes to them did nothing. Hi guys. I remember someone asked if i use RTM with TR. I have just reactivated my TR just to try out the FE-C pairing. My RTM firmware is up to date and calibrated with an external power meter. It pairs without any problems under FE-C connection. However, in TR pairing screen, i observed that the power from the trainer is almost 30% higher than the power meter. I selected the power matching function and did a workout in erg mode. The resistance are acting funny and erratic. Went back to power match to select the offset function. Tried a range of offset values but did not see improvement to accuracy of trainer power. Spindown also not possible and i was told by TR support to depend on Elite’s own calibration tool which i already ran. I can now conclude this is really a half baked product and not ideal for serious training even after adopting the FE-C protocol. Your money is better spent elsewhere. Uploading data to Strava and Training Peaks. To be connected to a MAC or iPad. primary ride being Mtb Bikes with a 12×42 axle’s. If you’re connecting to an iPad, then the KICKR will work better with Zwift than the Elite (as I don’t believe Zwift has added BT support for Elite yet). If you’re connecting to a Mac (using ANT+ USB stick), then it won’t matter as they are both supported pretty widely. Thanks, prob prefer using the MAC… as I can connect/stream to a Apple TV and a bigger screen. (My daughter has high jacked my iPad as a PLEX screen for herself). Other than the BT and ANT+ consideration as mentioned above ? personal preference. Personally took a liking to the Elite since I saw it, read bout it, but it’s a bit more expensive than the Wahoo. Anything the one does that the other does not. I’m in South Africa so 20% would have been great but eish, out if reach. How about creating training routes/plans. ride so far for % incline then so far for x, being able to upload control the trainer from the MAC? Assuming both integrate/upload to sites like Training peaks and Strava the same. I need to do 1-2 months of serious training, don’t have time to go out, so putting together a indoor setup to cram 1-2 hours 2-3 times a week in, my wknd rides are with wife which is way under level needed to get to where I want to be. The Elite has a significantly slower resistance changing time, especially for intervals. I talk a little bit about this in my 2015-2016 trainer recommendations guide. If you can make the KICKR work, I think it’s overall a much better technical and connected experience. However, it will be louder. And well the Wahoo is cheaper also. Like the export/share options it has, allottttttt. Along with the firmware update to Ant+ FE-C, Elite gave me a tool to set the resistance speed (faster) from the default setting. It is noticeably much faster now (good enough for intervals, sprinting, climbs on ziwft) Not sure if this is a release to all or just upon request. And as they say, The best laid plans…. The standard change is over 12 seconds, on special request they can give a firmware update that changes this to 6 seconds. This is 6 seconds from 0 – 2000 Watts… Thats a pretty steep change curve then. Now wondering, is this always then 6 seconds, even when 100->200 watts, 150->225, so the curve/change is slower. or is the curve always the same curve as the 0->2000 curve, so if changing from 100->150 then it is just about instantaneous. Those lower resistance i.e. below 200w is handled by the fluid resistance of the trainer. Bit the bullet and ordered a Wahoo Kickr. If thats how it starts then Wahoo already down the road and Elite looking for car keys still. For those with the Elite Arion Digital rollers, Elite have released a Beta tool for installing FE-C compatibility. Your rollers must be post 2014 and have a ‘Firmware Upgradable’ sticker on the underside to even consider this. However, the upgrade did not work with my rollers (35 attempts, 2 computers, 2 ANT+ sticks, only once was there any indication of anything happening and that failed at the end of Stage 1). The trouble is, the attempted upgrade disabled the Private ANT capability of the trainer, so it no longer responds to the Elite head unit or the iPad app, so the rollers are now junk unless Elite can produce some software that works. I await their response; I’ll post it here if and when I get it. 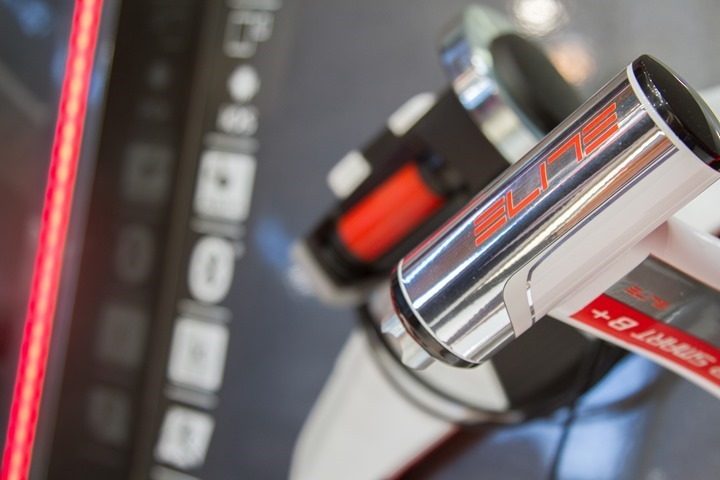 Elite helped me sort out the problem and now the rollers work very well being controlled by Zwift, Sufferfest or TR. Hi, does the Elite Qubo Digital Smart B+ only work plugged to a power outlet or can it work without ? Hi, I have a quick question. 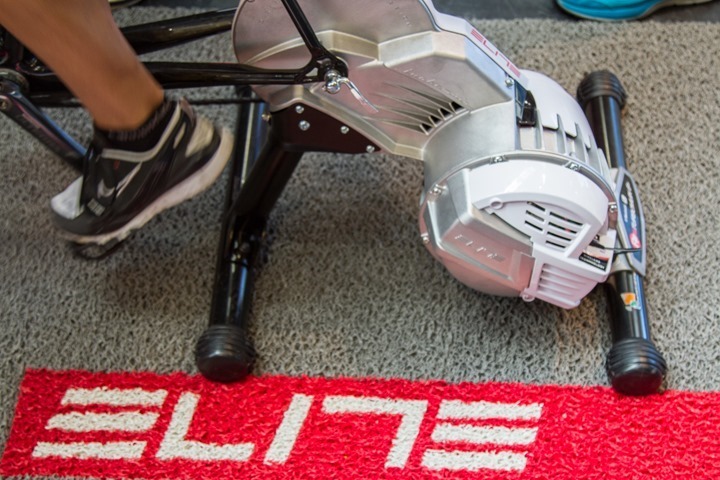 I love the freedom of the elite Real E-Motion trainer. What’s the difference in Real E-Motion and the b+ version? Just Bluetooth? Just trying to get an ANT+ dongle for my iphone 6/ipad in order to pair with my Elite emotion rollers (not the Bluetooth version). Do I have to buy the Elite specific dongle or can I buy a generic version? Does anyone know is it possible to control power meters resistance in Elite Qubo Digital Smart B+ throught Garmin 920? Or is it possible connect to the trainer with two devices(ANT for garmin that will be recieve all data(power, cadence, speed) and Bluetooth only for control resistance throuht myETraining app)? I will be glad to hear any solutions. The 920XT actually can’t control any trainers unfortunately. How do you think is it possible to create App/Widget for garmin 920xt that control it or this is probably limitation of SDK? Because if that possible it will be greate to create it. 100% definitely possible. However, nobody has done so to date (which is kinda silly to me). Would love to see one! I passed through the article and the comments (not through all completely as they’re really many!) and I find that there are two aspects that are not treated in detail in the trainers review and that I’m looking for in all the trainers now that I’m out for getting one. 2) the capability of the trainer to handle big resistance at low cadence. 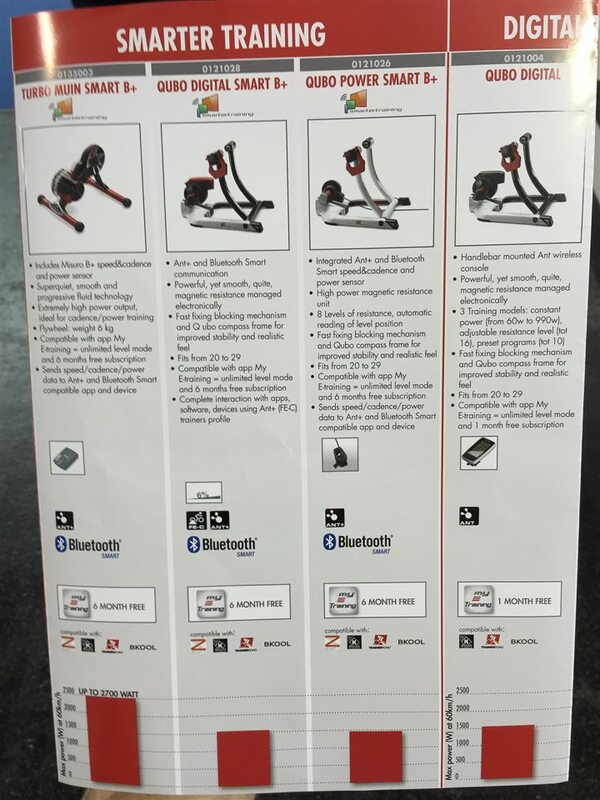 I would like to know how the trainers handle these two conditions because they are the basic of my workouts and when I tested a Elite Qubo Digital Smart B+ I noticed that it was basically not able to handle these two conditions in such a way to let me carry out an effective workout. Is there a specific reason why you did not focus on these for each trainer? I should anticipate that I tested only that Qubo, so could be that actually is the only one with these limits.. ? If that is not the case, are you planning on getting more specific about these aspects in your already published reviews? All my trainer reviews (this post is not a review), do include detailed tests, including on those things. All my reviews include quick shirt in power tests (usually 120w to 550w, and then a burst test to about 800w test). And all include low-cadence work at about 45-50RPM. You can see my Elite Drivo review as a recent example of that. Will Bluetooth from ios be able to control resistance on real turbo muin? Using stages for power. Unsure whether to get real turbo muin for £500 or Turbo Muin for £290?? Is the price difference worth it, is the resistance a gimmick in strava?